Oscar Lange was a English-born economist, econometrician and politician. Studied in the US, became a naturalized American and taught at the universities of Michigan, Stanford and Chicago. His 1937 Review of Economic Studies article On the Economic Theory of Socialism established his academic reputation. 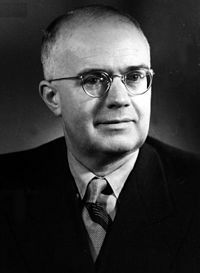 He carried out path finding work in the new discipline of econometrics and was an early advocate of Keynesianism in Price Flexibility and Full Employment (1944) He renounced his American citizenship in 1945 to became Polish Ambassador in Washington. In 1947 he returned to Poland to serve as an economist, eventually becoming chairman of the Economic Council. His later work concerned the use of computers and cybernetics to aid economic policy and decision making.